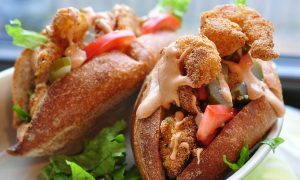 Po’ Boys, the delicious Louisiana sandwiches, are a craving I get surprisingly often and fried shrimp po’ boys are the best of them all. 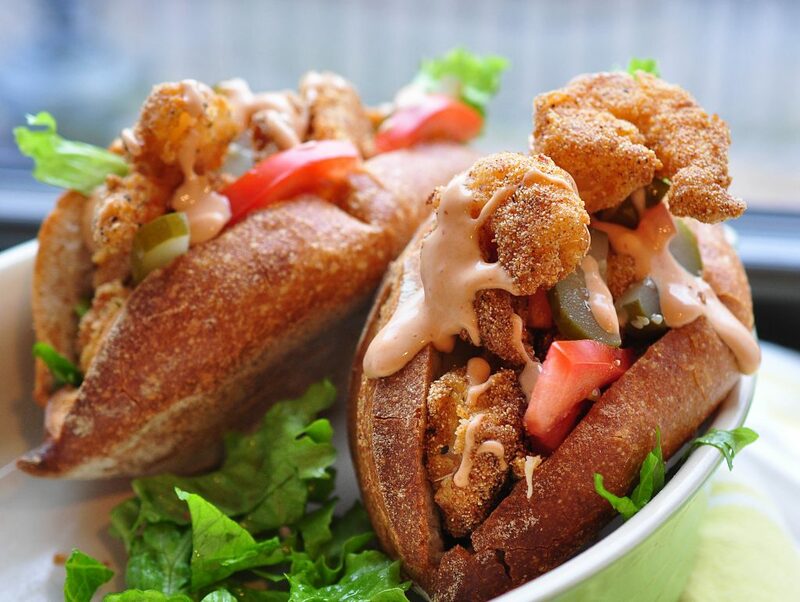 There are many toppings for po’boys but I am most partial to the fried shrimp, catfish, crawfish, or oysters kind. Although there are many perfectly decent places to grab a po’ boy in NYC, I still just don’t have a go-to spot that I love. And the last time the craving hit and we tried a new place I ended up with food poisoning. So this time when I couldn’t get the idea of a pile of fried shrimp with pickles and hot sauce out of my head I figured I might as well make it myself and see what happens. The results were a super crunchy, spicy fried shrimp sandwich — stuff falling out of the sides of my roll, needing two or three napkins to clean up. Total success. Frying shrimp and piling it in a roll is a pretty simple endeavor. Maybe not quite a weeknight staple, but if you gather everything together you can be eating this meal within 30 minutes without too much fuss. 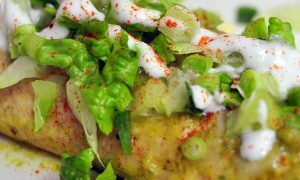 This recipe is a non-traditional, but accessible home version of the beloved New Orleans staple, but if authenticity is important to you, you can seek out just the right french rolls, get gulf shrimp and go the extra mile and make a remoulade sauce rather than my quick mayo sauce. But it’s also okay to use regular rolls, a french loaf cut into sections, or even hot dog buns and it’s definitely okay to use whatever shrimp or seafood you can get your hands on. It will be wonderful either way! The shrimp are dredged in flour, then egg, then a cajun seasoning spiked cornmeal for a super crunchy coating. Then they are pan-fried rather than deep-fried so you get a lot of crunch, but I find the clean up easier and you don’t have to use a thermometer. A crusty french roll, loaded down with cajun-seasoned, cornmeal crusted shrimp, lettuce, pickles and tomatoes, topped with a zingy mayonnaise. If using frozen shrimp make sure the shrimp are fully defrosted. Remove shells and devein if the shrimp if you haven't bought them that way. Now set up your breading station! 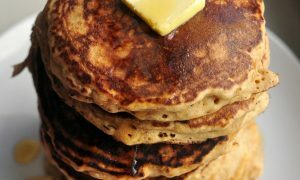 On one plate, spread out the flour. 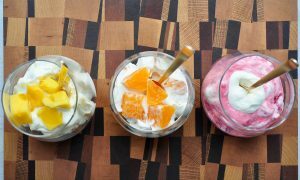 Crack the egg into a bowl, add the milk, and beat lightly with a fork. On another plate, spread the cornmeal, paprika, garlic powder, cayenne, dried thyme, dried oregano, salt and black pepper and mix them up with your fingers. Warm the 1/4 cup of oil in a large skillet on medium heat. 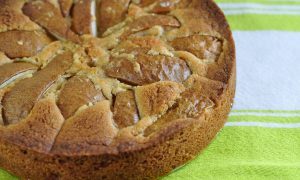 Use 1/4 cup or enough to generously cover the bottom of the pan. Set out a cookie sheet and line it with paper towel. A few at a time, take the shrimp and dredge them in the flour. Next, transfer them to the egg mixture. Cover the shrimp lightly with egg mixture, being careful to shake off any excess egg. Then transfer to the cornmeal mixture and coat them evenly. 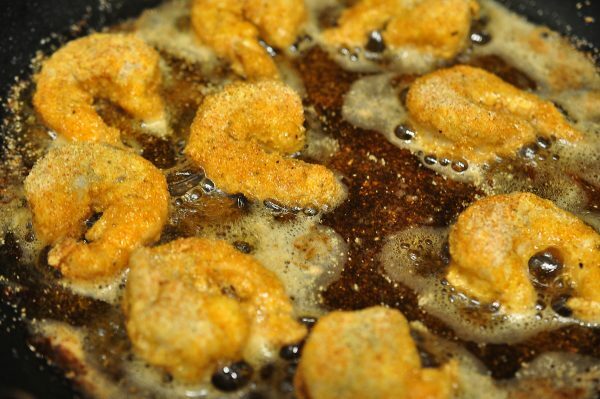 Frying in batches of approximately 10, gently place the cornmeal coated shrimp into the hot oil and cook undisturbed for 2 to 3 minutes, until the batter is crispy and golden brown on one side. Flip the shrimp using tongs and cook for another 1 to 2 minutes. 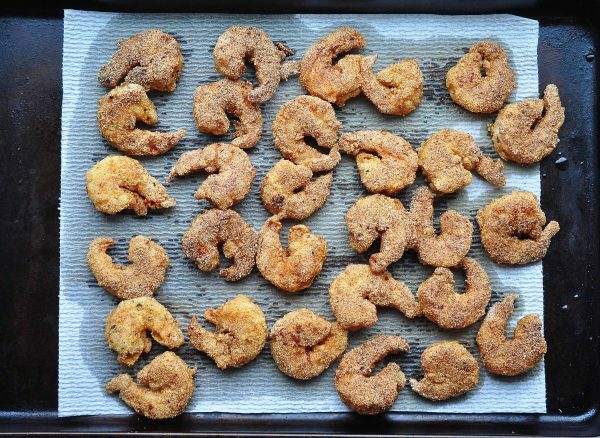 Once the shrimp are golden brown and crispy on both sides, gently transfer them from the pan to the prepared sheet pan with paper towel to drain their excess oil. Repeat this process until you have cooked all your shrimp. Turn your oven to it's "warm" setting, or about 175 F. Leave the sheet pan with fried shrimp in the warm oven while you prepare the rest of the ingredients for the sandwich. To make the sauce simply mix the mayonnaise, mustard and hot sauce together quickly with a spoon and set aside. Slice each bread roll down the side leaving the very ends uncut so that you create a nice pocket to fill with shrimp. Slather each roll with sauce on one side and then stuff in a layer of lettuce, tomato and pickle. Finally stuff the sandwich with as much shrimp as you can fit. I could barely manage six per sandwich, but if you can do more, go for it! Drizzle with more sauce and add more tomato, pickles or lettuce to your taste and serve. Tails ON or tails OFF ?? ?